The „Pipeline" is a hand-made reverb pedal reproducing the legendary and beloved spring reverb sound known from vintage tube amps. In a unique circuit it combines the particular advantages of analog and digital signal processing, resulting in a warm, deep and lush sounding reverb pedal, which is very easy to operate. Your direct dry guitar signal is processed fully analog, no digitization! Therefore your straight guitar signal is free of any digital latencies and the full character and dynamics of your guitar are completely preserved. Only the circuit section responsible for reverb calculations is realized digitally. This parallel digital signal is finally mixed together with the dry analog signal. „Reverb" allows you to adjust the reverb intensity. A good starting point is at 2 o'clock. „Volume" controls the pedal output volume ranging from silence up to +7dB boost. Unity gain is at the middle position. A three-way „Springs" toggle switch alters the number and length of the simulated springs: S=Short, M=Medium, L=Long. This results in different decay times, densities and frequency content of the reverb — just like the mechanical archetype. An internal trim pot allows further adjustment of your preferenced L(ong)-decay time. A „Tone" toggle switch allows you to change the treble content of the reverb signal. Switching from N(eutral) to B(right) or D(ark) variies the reverb signal presence content — ranging from warm and analog sounding reverbs or more trebly and crisp ones. Your straight guitar signal is of course not affected at all by this tone control! 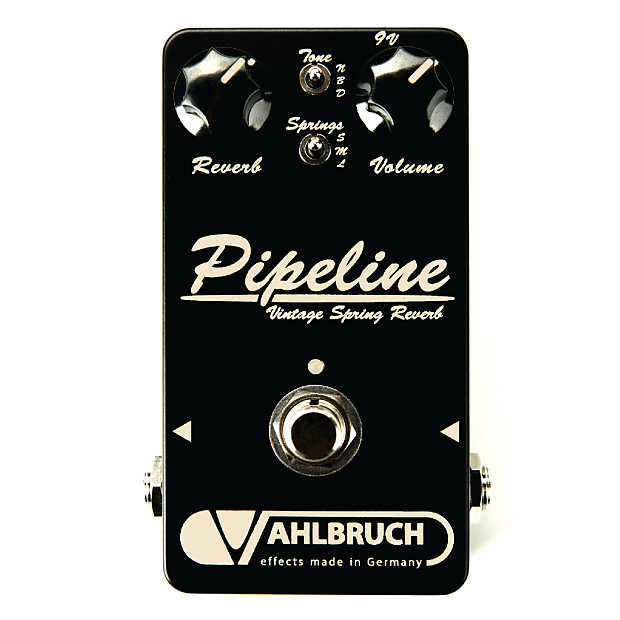 Like all Vahlbruch pedals the „Pipeline" is hand-made utilizing only the best components available worldwide for highend tone and years of trouble free operation. Free wiring of jacks and footswitch, no PCB-mounting! Ich versende mit Sendungsverfolgung in die aufgelisteten Länder. Bei Anfragen zu Versandkosten in andere Länder schickt mir bitte eine Nachricht.